Ever since hearing 'The Tower', Motorpsycho's latest album, I have been looking forward to going to this show. It has been a long while since I saw the band last. Probably 2001-02. Nighttown in Rotterdam was still a venue to play for bands this seize. In coming up close to two decades since then we have all, band and a considerable part of the audience, become men of a certain age. Not old, but certainly no longer young. What is not stopping us from rocking out. And that is a very funny thing I noticed straight away. There are distinct differences in how certain parts of the audience moves. I was under the impression that it gave away from what angle of musical favourites these people come, where their preferences lie. Why? Motorpsycho plays a hybrid of music. 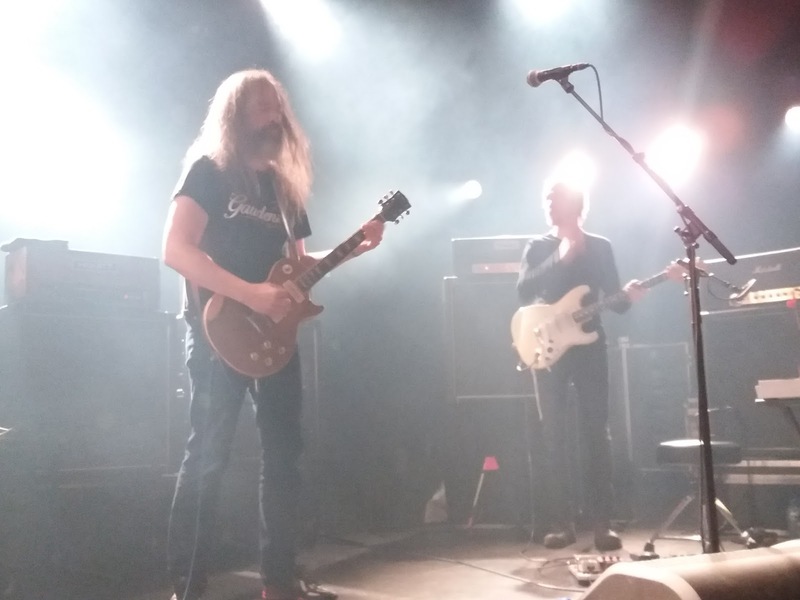 Equal parts metal/grunge, prog and melodic westcoast pop and rock, although the latter is snowed under more during a live show. Despite the at times nearly unrelenting loudness, the band never forgets the melodies. So it is that why, in my opinion, one part of the audience is moving their heads forwards and backwards and another part is swaying sideways, partially dancing. Including yours truly. Eight p.m. sharp the band walked on stage. Almost a bit uncertain, as if the audience may not recognise them. With the dj still playing his tracks as if he was the main show. A soft hello, a right arm raised and the band kicked off a storm that was to last for over two and a half hours. Somewhere during the first hour, with songs going to 10 minutes or effortless moving into the next one without a stop, I asked myself is this music good? Or beautiful? I came to a bit strange answer for myself. These questions were totally beside the point. 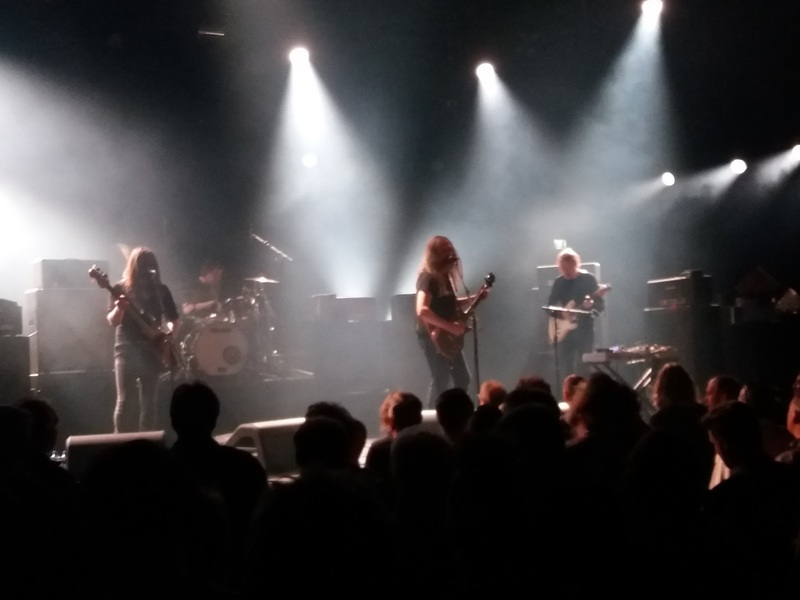 Motorpsycho live is a near total body experience. Whether a song is super melodic or is based on an (extremely) uncomfortable riff, that is the moment the band starts to take off on explorations of the inner structure of the song perhaps for the inner soul of the musicians showing their true selves through the notes and tempo changes that result from it. The guest guitarist and keyboard player, I did not catch his name but it may have been Kristopher, looked for cues at some points in songs, compositions may be a better word in some cases, to catch the moments that defined them. The result being that almost all songs show their beauty no matter what. Each song is built up from small parts. I was listening in awe to see how the individual musicians were trying to stretch those confinements or to experiment with how many notes or fills could be squeezed into these little segments, never failing to come out at the exactly right moment. In other words, these restraints did not seem to exist for them. The other moments I was in awe, is how well this band manages the dynamics within songs/jams. It never fails to impress and send shivers down my spine to hear a song be taken down into a very melodic part, with yet another effect on the guitar and/or keyboard, changing the whole world basically. Truly impressive how this band works together towards a total experience. Drummer Tomas Järmyr, only on board for two years, really showed what he was worth. At times every individual hit he made on a skin or cymbal could be heard in the mix so clearly. When he thought to make the bassdrum the driving rhythm in one of the songs, instead of the hi-hat, he may have been over-confident. Yet it looked like it took no effort at all to keep that rhythm going with his foot and leg. Fact is it gave the song a total different feel from all the other songs (in general as well). It looked gruelling having to keep this pace. There was one downside to the show, it was at times too loud. It interfered with my hearing properly and resulted in a permanent high note in my ears that I am sure the band was not producing. It also prevents the lyrics from being heard, which, I suppose, is an important part of the package Motorpsycho is producing for us. So why prevent us from truly hearing them? For the rest, what a show. An impressive two and a half hours of great music, in a venue I hadn't been to before. De Victorie is a fine venue I must say and totally new it seems. If the train connections worked just this bit better, it might be perfect. I already found a solution to that (not being a car). In other words, you may see me again sometime soon. Was it me or did Bent joke at the end, introducing him and Snah the other way around? That gives his "my best friend" quite a different angle as well! 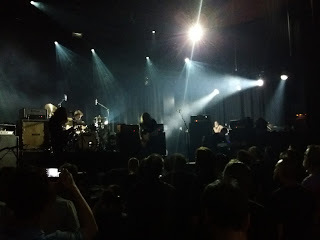 Communication other than through music is not Motorpsycho's aim nor forte. The best one was Bent introducing: "This is about", fall silent, never finishing his intended comment. The music compensates and tells all.